The two men by the door are blacksmiths, each with a hammer in hand and wearing a leather apron. 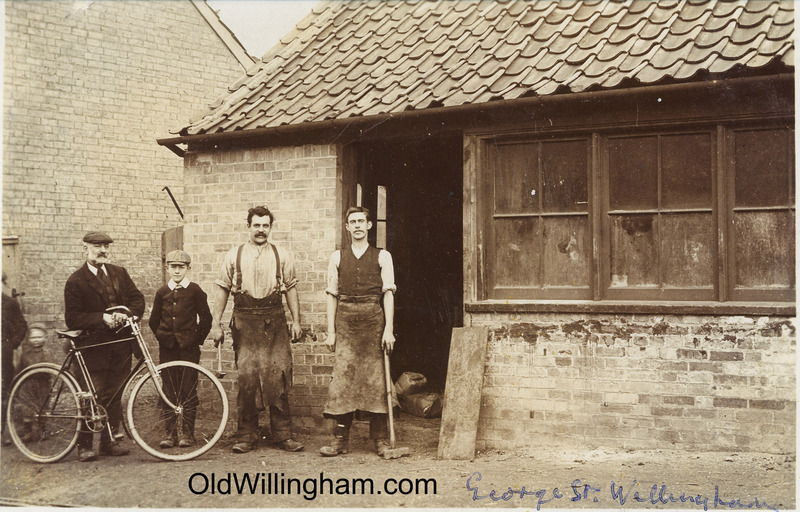 The burly man on the left might be the master smithy and the younger man his apprentice. This building stood where Foreman’s garage is today – at the top of George Street. In those days horses were very much part of village life and the blacksmith would provide and fit their shoes. But the work of the forge was far wider producing all manner of ironwork for domestic and agricultural purposes. It seems there has been a forge on this site for some time – it is marked as such on the map around 1900 – and it seems natural that it changed into a workshop and garage during the 20th century.